Be the first to share your favorite memory, photo or story of Eula Faye. This memorial page is dedicated for family, friends and future generations to celebrate the life of their loved one. 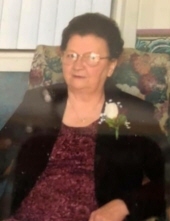 Mrs. Eula Faye Stevens Maddix, age 82, of Grahn, Kentucky, passed away Saturday morning, March 30, 2019, at the Elliott Nursing and Rehabilitation Center in Sandy Hook, Kentucky. She was born June 6, 1936, in Carter County, Kentucky, a daughter of the late Tom and Emma Knipp Stevens. Faye attended the Clifty United Baptist Church and retired after many years of service from the sewing factory. In addition to her parents, she was preceded in death by her husband of 56 years, James “Johnny” Maddix; one great-grandson, Lucas Jordan; seven brothers, Earl Stevens, Burl Stevens, Sturl Stevens, Clyde Stevens, Robert Stevens, Jack Stevens and Cledith Adkins; and three sisters, Irene Stevens Holbrook, Clara Stevens Roar and Nancy Stevens Barker. Faye is survived by one son, James Michael Maddix of Richmond, Virginia; one daughter, Vicki Maddix Gilbert (W.C.) of Olive Hill, Kentucky; two grandchildren, Chad Gilbert (Jessica) and Kayla Jordan (Brandon); three great grandchildren, Lily Gilbert, Caleb Jordan and Paige Jordan; and three brothers, Gene Stevens (Janice) of Olive Hill, Kentucky, Carlos Stevens (Sally) of Atwater, Ohio and Arnold Adkins (Gail) of Bardstown, Kentucky. She also leaves many other family members and friends who will sadly miss her. A graveside service will be held at 11 a.m. Monday, April 1, 2019 at Pleasant Hill Cemetery in Carter County, Kentucky with Ben James officiating. Friends may visit from 6 p.m. to 8 p.m. Sunday, March 31, 2019 at Grayson Funeral Home & Cremation Services, 49 McCoy Road, Grayson, Kentucky 41143. To send flowers or a remembrance gift to the family of Eula Faye Stevens Maddix, please visit our Tribute Store. "Email Address" would like to share the life celebration of Eula Faye Stevens Maddix. Click on the "link" to go to share a favorite memory or leave a condolence message for the family.